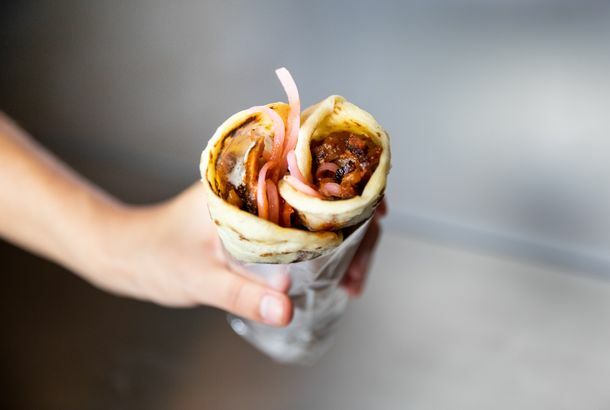 At David Chang’s New Bāng Bar, They’re Carving Mortadella Off the SpitIt’s Momofuku’s take on mall food, featuring freshly made flatbread, doner-kebab-inspired meats, and even cinnamon buns. Now Even Subway Stations Will Get Their Own High-End Food HallsNext up: New York City discovers floating markets. Whole Foods Columbus Circle Got a Liquor License, Plans Cocktails for ShoppersOver in Brooklyn, the Gowanus store got its application shot down. Your Holiday Shopping Is Going to Be Very Tasty This YearFood vendors are announced for Brooklyn Flea’s Gifted as well as the Holiday Markets at Union Square and Columbus Circle. Midnight Muffulettas: Big Daddy’s UWS, Huey’s 24/7 Diner in MidtownA New York City diner moves uptown, while a New Orleans chain comes to midtown. Pretzel Specialist Rises in the East Village; Karaoke Hits Clinton HillPlus: Fika’s top chocolates, and the Time Warner Center’s new food club, in our regular roundup of neighborhood food news. First Look at A Voce Columbus, Now Accepting ReservationsSee the space and the menu. A Voce Columbus Opening September 18; Chef Changes at GothamPlus: Motorino 2.0 is also opening in September, and a new chocolate shop is coming to Flatiron, in our regular roundup of neighborhood food news. Michael White to Open Seafood Restaurant in Former San Domenico SpaceWhite and partner Chris Cannon can live with the rent that drove San Domenico downtown. Blue Ribbon Sushi at Columbus Circle Will Open in October A reader wrote us today: I was walking past the soon-to-be-open since this summer Blue Ribbon Sushi at 6 Columbus Circle on my way back from lunch. A guy who looked like he was in charge (headset and all) was talking to a bunch of construction workers who were working on it so I figured I’d ask when it was suppose to (FINALLY) open … his answer: October 1st. Our photographer, Melissa Hom, went up for a look and confirmed the date. Click on the headline to see a larger version of the photo.